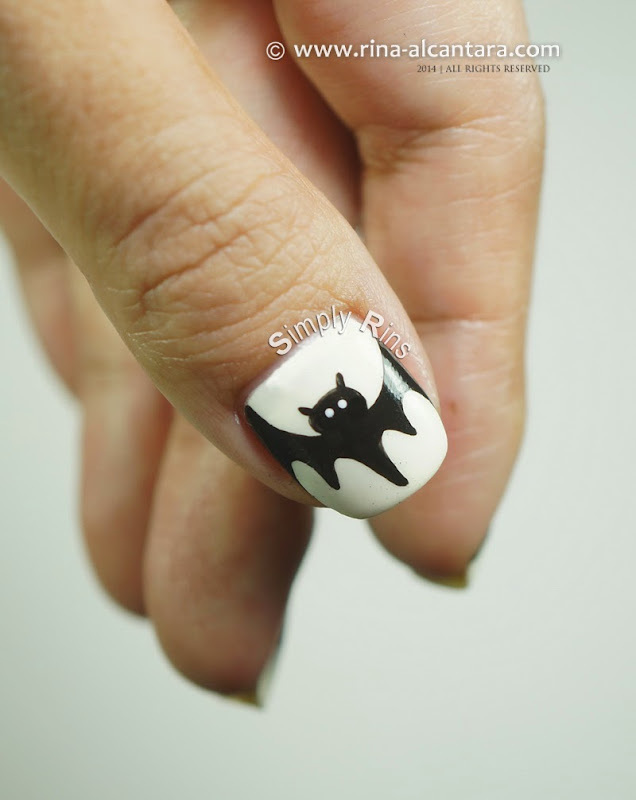 Bats is the inspiration for the 4th installment of my 2014 Halloween nail art series. I have mixed feelings about this nail art and so I think this post will be short and quick with only a few pictures. I don't know how to put in words how I feel about the results. But it seems like it lacks something to be interesting enough. The initial idea was to create bat tips. But I figured it wouldn't look like bats if the wings will not show. So I decided to paint the bats on the middle of each nail with its wings stretched out on both sides. And as I was painting the first bat, I was satisfied with how it looked so I continued on with the rest of my nails. But when I finished, I think it looked more like Batman nails! Lol! 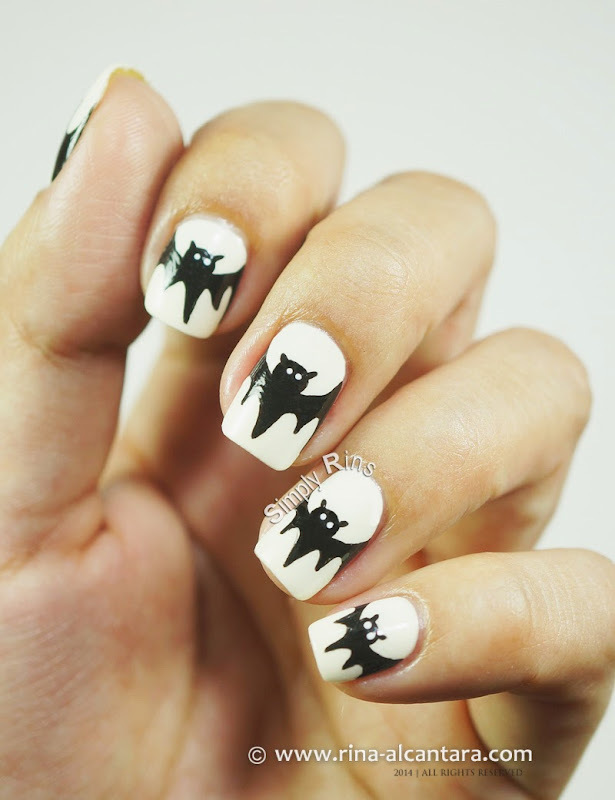 This freehand Halloween nail art was painted using black and white acrylic paint and a detail nail art brush. It was easy to work with my dominant hand but I have to admit that it was quite a challenge to do my right hand. How I wish I could have come up with a mix and match theme for this nail art. Perhaps that would have made a difference on how I feel about this bats nail design. There's not much details on the bats. The only detail added are 2 tiny white dots for the eyes. Well, I will leave it to you to judge my bats nail art for Halloween. I do guarantee that this is not a spooky design if you want something scary for the upcoming season. I'm saying a deafening YES to the adorable bats! They're cute, but I think I can see a couple of reasons why they feel like they're lacking something. For one, every nail is exactly the same - since it's a very simple design, it'd probably feel a bit more complex and interesting if the bats were tilted at different angles on each nail. The other thing that might be part of it is that it's only black and white. The pure white background definitely detracts from any potential "spooky" factor. You don't even necessarily need to add other colors - something as simple as a pattern in the background would probably make a big difference. I actually think horizontal stripes would look great. They could be black and white but of course orange and black would look great too... or orange and purple, purple and green, etc. Any Halloween-ish color combination would be awesome. I'm not sure Rina was looking for that kind of review! The simplicity makes it perfect! Halloween up close....... Abstract from far away, and easy enough for beginners to try. Personally, I think adding too much to this would make it gaudy and over the top!